Barry Gray's thrilling music is a highlight of all the Anderson programs that he scored. 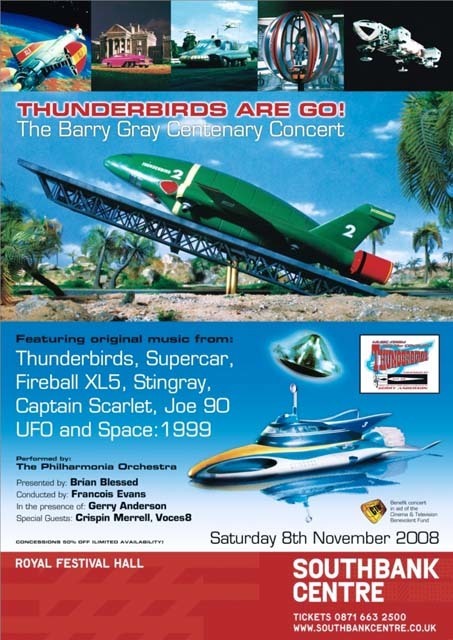 Who can forget the action packed Zero-X music, the brilliant Thunderbirds scores, the jazzy UFO theme, and so many more? 2008 marked the 100th anniversary of Barry''s birth, and the Barry Gray Centenary Concert, "Music From The 21st Century", was staged in November to commemorate this event. A limited number of souvenir program books were printed and sold at the concert. FabGear has obtained a very small amount of these wonderful, all-color books for fans who couldn''t make it to London for the event, or for those who wish they'd bought more copies! This oversized pamphlet is 36 pages long and includes a full biography of Gray, as well as remembrances of his friends and colleagues and many never-before-seen photos, as well as Barry''s own cartoon art! Also included are a timeline of Barry''s work, excerpts from his notebooks and hand written scores, a production index, profiles of the musicians who played at the concert, and a Foreword by Gerry Anderson himself! If you're a fan of Thunderbirds, Captain Scarlet, Stingray, Fireball XL5, Supercar, UFO, Space: 1999, or Barry Gray and his music, you MUST have this amazing book! Souvenir Book From The Barry Gray Centenary Concert! Commemorating 100 Years of Barry Gray.